We get this question a lot. The answer is, it depends upon where you are. In some areas yurts are welcomed by local authorities. In other areas yurts are not allowed. How do you find out if yurts are legal or welcome in your area? Fortunately we work with building engineers who confirm that our yurt design meets standards that help our customers when working with county officials. Rural areas are sometimes easier to work with. Often in rural areas where laws are not very strict, people have set up yurts without even needing a permit. You decide how to navigate your situation. We are glad to coach you along and help you with this. Some urban areas are very yurt friendly also. Some are not. It is quite easy to find out. You start by contacting your local zoning official. You can prepare a nice notebook with photos of yurts collected from our gallery and across the internet. Find stories about people living in yurts and put those in your notebook. Dress nice and take this notebook to the zoning office in your county. This will make a good impression and start the journey on a positive note. Let the zoning official know that our yurt design is stamped by an engineer, and that we can make changes if your county has additional requirements. Also let them know that our platform/deck design for your yurt foundation is up to code for a house! In the past it was easy to set up yurts just about everywhere. In the last few years we have seen that in some areas authorities want more to say about it. Sometimes this is a hassle for new yurt owners, yet most of the time we can get through this together! Many people tell us that counties are just looking for revenue, so you may have to pay for a permit to please them. That’s ok, it’s not usually very much. 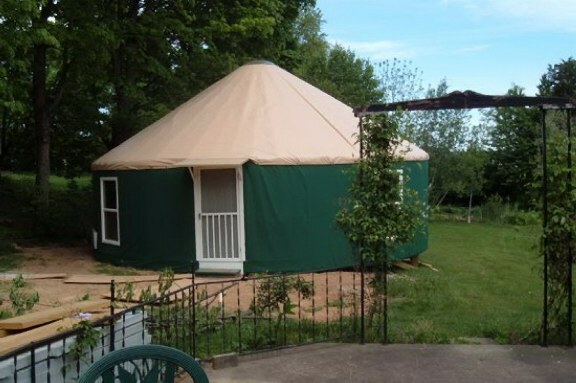 If you have any questions about this part of yurt ownership, give us call and we’ll be happy to talk with you! Next post: How Important is Window Placement?